As the annual American Advertising Awards came around, 15 graphic designers from Associated Students Inc. (ASI) Marketing, Design and Public Relations (MDPR) department swept the board winning 15 awards in gold, silver and bronze for their respective categories. This year’s award ceremony took place on March 17 at the historic Mission Inn Hotel and Spa in Riverside, California. Hosted by the Inland Empire American Advertising Federation (AAF), the award ceremony is an opportunity for students to showcase their work alongside other collegiate designers and compete for awards. Lead designer at MDPR and fourth-year graphic design student Adrian Arvizu won bronze in the “Poster Design” category for his Traveling Show poster. Arvizu won bronze the previous year, however, he noted that MDPR as a whole performed better this time around. This year, four new designers at MDPR entered the competition and were able to flex their creativity in front of AAF, such as fifth-year graphic design student Dimitri Koutroulis who won silver for his Murder Mystery poster. “I was inspired by the textures and colors of ’50s posters and there were some similarities with an “Indiana Jones“ font I found,” Koutroulis said. At the end of the night, MDPR took home eight bronze, four silver and three gold awards. Gold recipients included third-year graphic design student Jocelyn Chung and recent Cal Poly Pomona (CPP) alumni Leon Wells and Kelly Rice. The three gold awards MDPR won for annual report, poster design and illustration. Rice was recognized for her work on ASI’s Annual Report. “The annual report is one of MDPR’s biggest projects of the year and I’m so proud to have been a part of it. The most memorable aspect of working on the annual report was the collaboration involved in every step of its nearly year-long process,” Rice said. “I was able to work directly with writers, managers and even the executive director of ASI. The annual report is truly an intense project and I’m thrilled that the many months of incredibly hard work I put into it have paid off. Fellow CPP alumni Leon Wells won gold in the “Illustration” category for his ASI Cycling Mural, housed at the Bronco Recreation and Intramural Complex (BRIC). 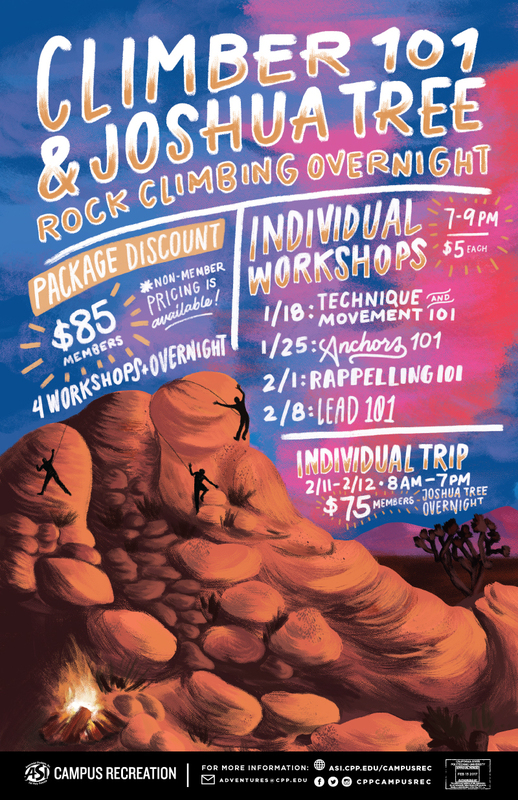 Even though she wasn’t able to attend the event, third-year graphic design student Jocelyn Chung took home the gold for her Joshua Tree Rock Climbing Overnight poster. Although some of the participating designers had previous experience entering their art in on-campus competitions, these awards had higher stakes for some. MDPR’s award-winning designers from left to right: Alexia Andrade, Lea Catbagan, Adrian Arvizu, Dustin Glauser, Summer Furzer, Lisa Juarez and Chad Lynn. With each participating designer winning an award in their respective category, MDPR walked away from another successful year at the American Advertising Awards. To keep up with more ASI news, updates and events, follow us on Facebook, Twitter, Instagram and Snapchat @ASICPP!